A variety of motivational themes here, from access to Customer Favorites, to all styles, colors and sizes sotcked, to online linkage via QR code, or helpful Sales Associate and free shipping. Though the message is mixed, it seems magnificent in strategy and lacks not in reasons for customer engagement. Though just a tad overwhelming, kudos to the copywriter. Can you think of a better message that includes and intrigues based upon all these aspects? 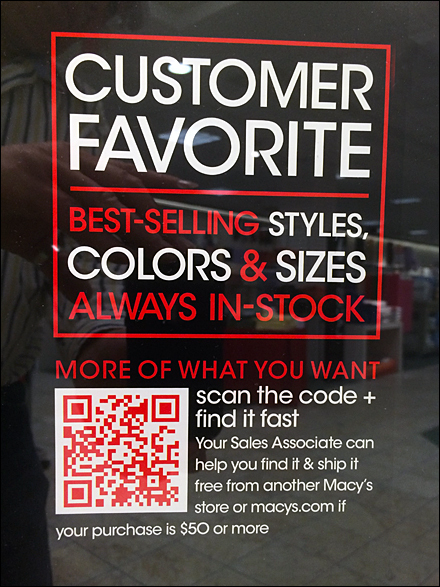 CLICK the thumbnail for closeup of the QR code and body copy. 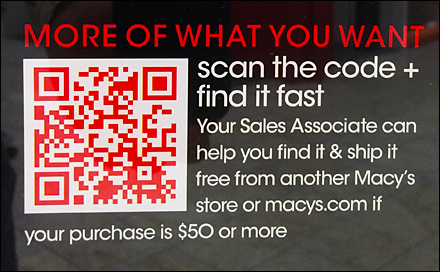 For fun, snap the QR and see where it takes you.